Will gold and silver also be victims of EU war on cash? Predictably, the restrictions are being sold to citizens as a means of fighting terrorism – much like a host of other privacy and liberty-destroying power grabs in recent decades. This despite a telling admission contained in the proposal: “There remains the lack of readily available and solid evidence on legitimate versus illegitimate cash transactions.” Ban the use of cash first, ask questions later. Gold Today –New York closed at $1,159.00 Friday after closing at $1,172.40 on the 8th December. London opened again at $1,155.00 today. – The $: € was stronger at $1.0589: €1 from $1.0615: €1 Friday. – The Dollar index was stronger at 101.40 from 100.11 Friday. – The Yen was weaker at 115.76: $1 from Friday’s 114.41 against the dollar. – The Yuan was weaker at 6.9138: $1 from 6.9033: $1 Friday. – The Pound Sterling was weaker at $1.2585: £1 from Friday’s $1.2602: £1. While Shanghai prices fell, they did not follow New York leaving New York at a higher discount to Shanghai of $29.21. London opened at an even higher discount to Shanghai of $33.21. This further emphasizes that the two markets are structurally different to each other. The physically settled Shanghai transactions and the paper transactions of New York and London. The London OTC [over the counter] markets is one where well over 95% of transactions are closed out before maturity. In New York and London players will move prices around faster and further than in Shanghai because they know that they will not have to deliver. As we were saying last week, gold sold from the SPDR gold ETF is to HSBC in London who can sell it, take it onto their books or export it to China to be sold there. The People’s Bank of China has now imposed controls over the export of Yuan. Amounts over Y5,000,000 must be accompanied by the reasons for the export. We do not see these as applying to purchases of gold as such transactions are in the interests of China. But the Yuan continues to fall. We see the PBoC as refusing to allow the large exports of Yuan where property purchases are to be made, or other more speculative deals. LBMA price setting: The LBMA gold price setting was at $1,154.40 this morning against Friday’s $1,168.90. But prices began to pick up a little after New York opened before slippiung back again.. The gold price in the euro was set higher at €1,088.03 after yesterday’s €1,103.05. Ahead of the opening of New York the gold price was trading at $1,155.60 and in the euro at €1,089.11. At the same time, the silver price was trading at $16.94. The strong dollar continues to have a negative impact on the gold price. 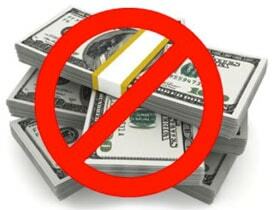 Cashless Societies – More and more evidence is being gathered that central banks favour moving to “cashless” societies. It is a most disturbing trend that developed world citizens seem to be accepting more than emerging countries [India, Venezuela] because of their well developed banking systems. In the past gold was seen in the U.S. as competition to the dollar bill. This was overcome by confiscating gold and putting it squarely behind the dollar. Gold was removed from the public domain for 41 years allowing time for the new generations to see gold as a commodity. With current moves against cash, a similar process is happening. Cash is in competition to the banks, insofar as it can give citizens an alternative to debit/credit cards that rule our lives currently. What does not seem to have been understood is that if or when cash is banned gold must be too. We will be writing on this extensively in the Gold Forecaster and suggest you look at www.Stockbridgemgmt.com where a system of preventing such confiscation is in place. On Wednesday the Fed is expected to lift interest rates by 25 basis points. If they don’t, expect all markets to be in turmoil, including gold. But we don’t see such a surprise particularly in the light of the oil supply cuts agreed by OPEC and non-OPEC suppliers. This will spur inflation but a bad inflation. The oil price is up around the mid-$50s already. But it represents a withdrawal of liquidity from the system, the same as tax payments do, but without it going into government hands. Oil price hikes do not foster growth, they actually attack it. Will this change make the Fed cautious? The oil “Fracking” community will be pleased, but unless higher oil prices are persistent they remain vulnerable as lower prices will force a discontinuation of U.S. production for many companies. So it is likely that under Trump we could see tariffs not only on Chinese goods but on imported oil. This week may well see gold prices drift lower alongside more ETF sales, but we are getting close to a period of turbulences and volatility which could undermine expectations easily. 2017 – The attitude Trump is showing to China with him not feeling bound by a ‘one’ China policy, points to either a hard negotiating stance to force China to make more concessions or a dangerous trade war. China is in a very strong position if this happens. Each of the U.S. companies that exported their production to China has seen the Chinese set up a local factory that produces the same product under a Chinese name. The 45% tariff he has threatened on Chinese goods will be met with heavy counter measures. An international trade war will cause lasting de-globalization but is more likely to hurt the U.S. more than China. After all the E.U. is a bigger client of China than the U.S. Now add to that the rest of the world that imports Chinese goods. The spectre of China asking for payment in Yuan for Chinese exports or insisting on paying Yuan for imports rears its frightening head. Gold ETFs – On Friday, there were sales of 3.261 tonnes from the SPDR gold ETF and purchases 0f 0.03 into the Gold Trust holdings, leaving their respective holdings at 857.445 tonnes and 198.06 tonnes. These sales continue to pull gold prices down. Since January 4th this year, 254.526 tonnes of gold has been added to the SPDR gold ETF and to the Gold Trust. The consumer price index (CPI), a measure of inflation, came in hotter than expected Friday, registering 2.3 percent year-over-year in August on expectations of 2.0 percent. With the five-year Treasury yielding 1.19 percent, government bond investors are now receiving a negative real rate of return (because 2.3 minus 1.19 comes out to negative 1.11 percent). This is highly constructive for the price of gold. As I’ve discussed many times before, the yellow metal has benefited when real rates have fallen below zero. This was the case in September 2011 when gold hit its all-time high of $1,900 per ounce. 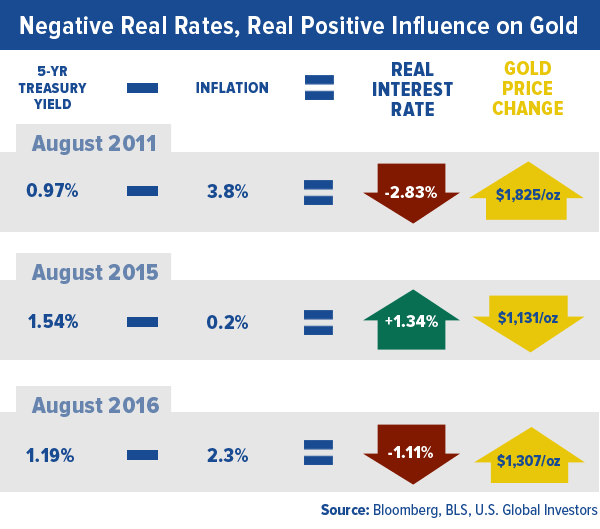 And last year around this time, the opposite was true—positive real rates were a drag on gold. Although gold sunk to a two-week low on a strong U.S. dollar and fears over this week’s Federal Reserve meeting, the drivers are firmly in place to push prices higher. Maybe you’ve heard that a new book out right now is planting propaganda voice in the war on cash. 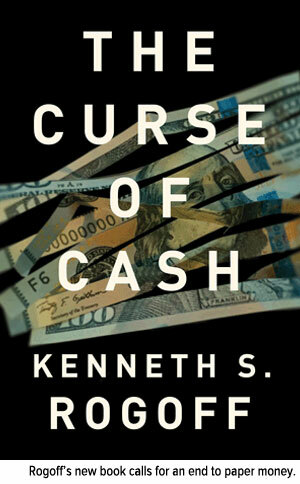 In “The Curse of Cash,” Harvard economics professor Kenneth Rogoff makes the case that nixing paper money—at the very least, larger-denominated bills—“could help more than you might think” in combating criminal activities such as drug trafficking, corruption, extortion and money laundering. It could even prevent the spread of terrorism and discourage illegal immigration, Rogoff argues. But in a world where nothing larger than a $10 bill exists, hoarding cash would be highly impractical. Better to buy that new boat you don’t need! Instead, perhaps Rogoff should consider “The Curse of No Cash.” Does he not recall what happened in Cyprus just three years ago? The government ransacked citizens’ bank accounts to “fix” its own mistakes and mismanagement. In example after example, people’s rights to save and freely hold cash have been disrupted, with tragic results. I’m not the only one who disagrees with the ideas in Rogoff’s polemic against money. As of this writing, nearly three quarters of Amazon customers have given the book a rating of two or fewer stars. And in a scathing Wall Street Journal op-ed, respected financial writer James Grant strips away the book’s “technical pretense” to uncover its true motive. Rogoff, he writes, “wants the government to control your money,” which is the extreme form of Keynesian economics. There’s one area where Rogoff and I both agree, though. “As paper currency is phased out,” he writes, “gold prices will rise.” Were cash eliminated and interest rates plunged underwater, gold’s role as a store of value would become even more apparent and demand for the yellow metal would turn red hot, despite its price appreciation. This has been the case in countless past examples. Rogoff himself cites Indians’ longstanding love of and cultural affinity to gold jewelry as protection against currency uncertainty. For centuries, inhabitants of the Indian subcontinent saw continuous regime change, not to mention imperialist rule by various European forces. During all this time, the one stable and widely accepted currency was gold. The tradition carries on today. A third of Indian gold jewelry demand comes from rural farmers, who annually convert a portion of their crop revenues into the yellow metal. Whether this gold is stored or given to a female family member, perhaps a daughter, before her wedding day, its purpose is twofold: one, as a beautiful heirloom to be worn and passed down to the next generation, and two, as a form of financial security. 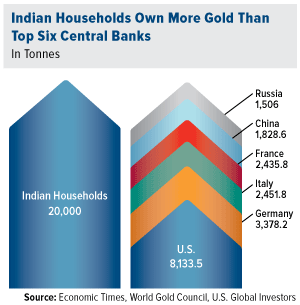 It’s estimated that Indian households currently holdmore than 20,000 tonnes of gold. To put that in perspective, 20,000 tonnes is more than the official gold holdings of the U.S., Germany, Italy, France, China and Russia combined. With speculation strong that a rupee devaluation is imminent, it makes just as much sense now as ever for Indians to have at least some of their wealth in gold. When the rupee unexpectedly dipped to record lows in August 2013, the wealth that prudent Indians had stored in the precious metal was, for the time being, safe. Although there’s little fear right now that the U.S. dollar is in trouble, I still recommend that investors maintain a 10 percent weighting in gold—5 percent in gold stocks, 5 percent in gold coins and jewelry.